Dog Bone Riser – Circa 1990, originally uploaded by Bob Goyetche. I’m in a band again. Honestly, I didn’t think it would happen. I was last in a band about 10 years ago, and I didn’t see how my life pace/activities would allow for that to happen again. I’ve joined Phantom49, a local band mostly made up of friends I’ve known for a long time. 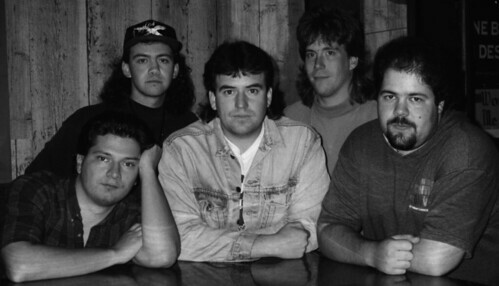 In fact, there’s three of us up in that picture from 1990 in a (great) band called “Dog Bone Rizer”. . There’s something to be said for the three guys in the left of the picture above to end up in a band together almost 20 years later… I’m not quite sure what it is, but I’m sure it’s something. That’s Brad Hodge on the top left (the mullet’s gone now, let it go) .. I was his best man at his wedding, and he was my best man at mine. He’s one of maybe 2 or 3 people I would feel comfortable calling at 3am to help me out of trouble. We share a friendship that has stood the test of time/women/music/etc, and I’m thrilled at the idea of being in a band with him again. There’s a special bond that’s shared with people that make music together, and that’s just one of many bonds Brad and I share. Sebastien’s the new guy (to me).. His background is similar to ours, and I know we connect musically, and for our love of Canon photography gear. I look forward to getting to know him – As I already know I enjoy playing with him. So how did it happen? A bunch of us were out a few weeks ago celebrating a friends birthday, and the topic of music came up. One thing leads to another, and I’ve joined the band. Oh how my spirit is enjoying this. Music is a wonderful thing, it’s a friend, lover, and therapy wrapped into one, and something that I’ve been missing for years. Being in a band at this age is a somewhat different experience for me this time around. I’m more self-assured, I don’t feel the need to jusitfy my existence, and I honestly think I play better because of it. I’m having a blast switching between guitar and keyboards again, and really just enjoying making music with my friends. Maybe Willie Nelson was on to something after all..
« Know who, and also why.